The textile boxes offer dramatically improved portability, and are space-saving to boot! 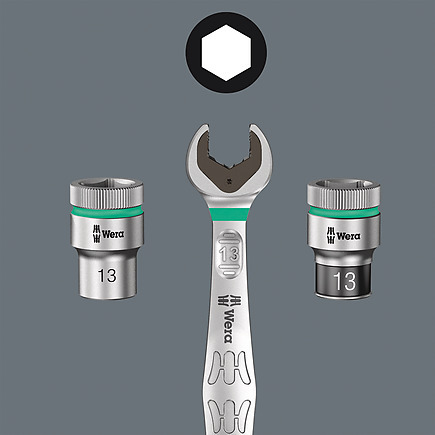 This means you can now carry the same collection of tools, in a much more compact and comfortable package. 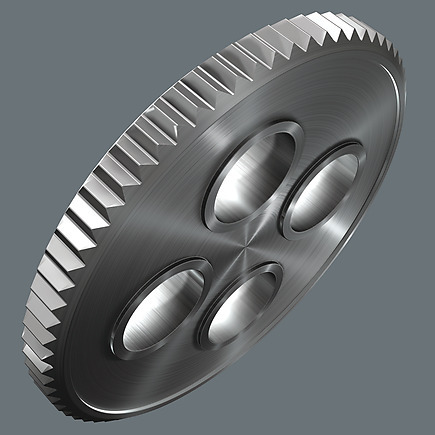 The hassle of running back and forth for the right tools has now become a thing of the past. And the much lower weight of a set makes carrying more convenient than ever before. The textile box including the tool will even survive a fall undamaged. The all new smooth turning mechanism guarantees both secure and rattle-free storage, yet allows easy removal of the tool. 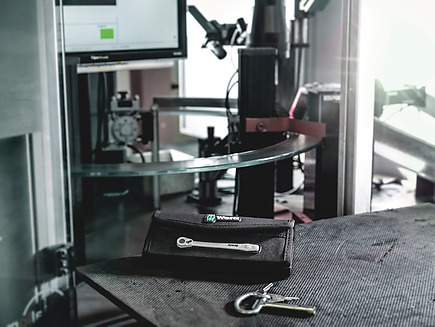 Due to the ever-more confined working environment, space is becoming more and more an issue for the application of ratchets. 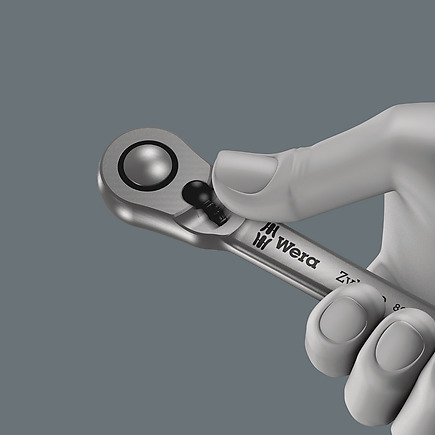 Our product developers therefore intensively occupied themselves with the issue of confined working spaces, and Wera has now solved this problem. 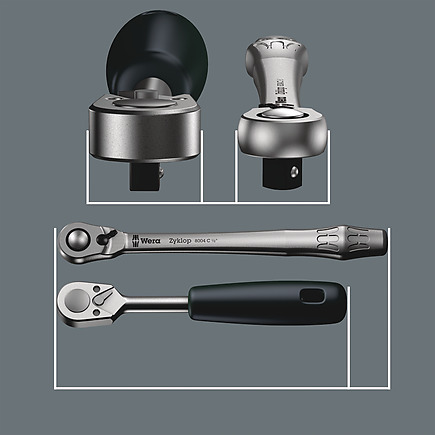 The extremely slim and robust Zyklop Metal ratchet with a long lever was what emerged. 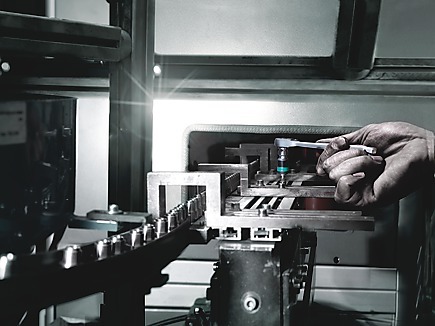 When the change in direction needs to be quick, the Zyklop Metal Switch ratchet is the right tool. When the socket must not get lost and a coincidental change of direction has to be avoided at all cost, the Zyklop Metal Push is the correct choice. Forged, full metal ratchet (chrome-molybdenum) that is extremely robust with a long service life; slim design to enable work in very confined spaces. Switch lever for convenient change of direction. Take it easy tool finder system - with profile and size colour-coding for quick and easy tool selection. 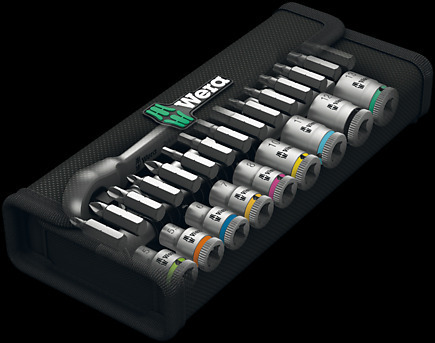 Colour-coded system for hexagon drive screws (L-Keys, Zyklop bit sockets), external hex drive screws and nuts (Joker wrenches, Zyklop sockets and Zyklop bit sockets with holding function), and TORX® drive screws (L-Keys, Zyklop bit sockets). 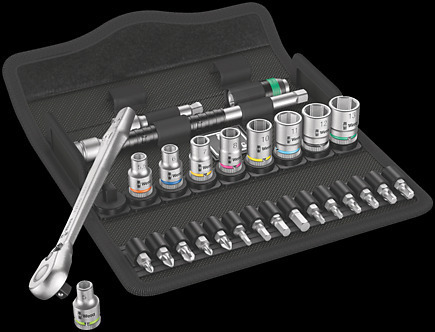 Incredibly compact set arrangement with many tools in a minimum of space. A completely new ratchet set feeling thanks to the unique textile boxes that are very robust and durable. They can be positioned upright for tidy storage on the workshop shelf. Additional surface protection due to textile outer material. Low weight and volume for simpler mobility. "Take it easy" Tool Finder with colour coding according to sizes.